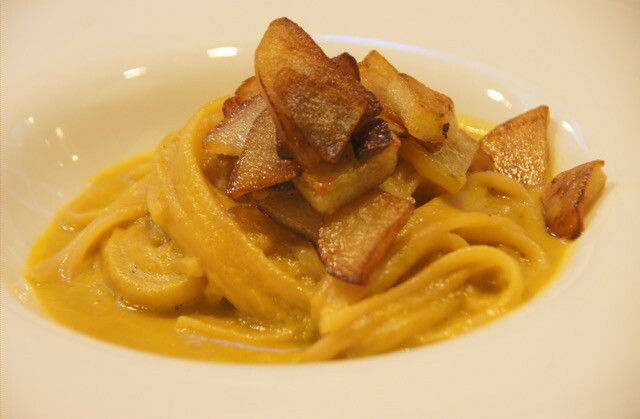 Home Travel Italy Vegan Carbonara in Venice! I know we’re in the middle of our 40-day Greek extravaganza at the moment, but I just HAVE to make a brief interruption to tell you about this. Remember in the last post when we ate that amazing vegan meal inside the ruins of a centuries-old Venetian building left from the days when Crete was ruled by Venice? Yeah, well, this weekend we went to the real Venice and ate more delicious vegan food! While Nick and I had both been there once before, that was about 15 years ago, and we had never experienced the city together. It’s a magical place really, one that almost doesn’t seem real. Indeed, much has been said about its Disneyesque atmosphere, and as a former employee of EPCOT Center I will admit that St. Mark’s Square is probably the only location featured in the park that, in real life, actually resembles its Disney replica. Nevertheless, it should not be forgotten that this IS the real deal – this city that has defied the odds and held its ground here on swampy marshland for hundreds of years – and that real life actually can be THIS achingly beautiful. We arrived in town at around two o’clock in the afternoon and were definitely ready to eat, so after dropping off our bags at our accommodation we basically just plopped ourselves down at one of the first restaurants we came to, which was a place called Hostaria Galileo. It was a sunny afternoon, and they had plenty of outdoor tables on a quiet piazza where we could bask in the sun, which was the main reason we chose it. I have to say, I don’t think we chose that well. We both ordered the pizza, which wasn’t terrible but certainly wasn’t among the best pizza we’ve had in Italy. 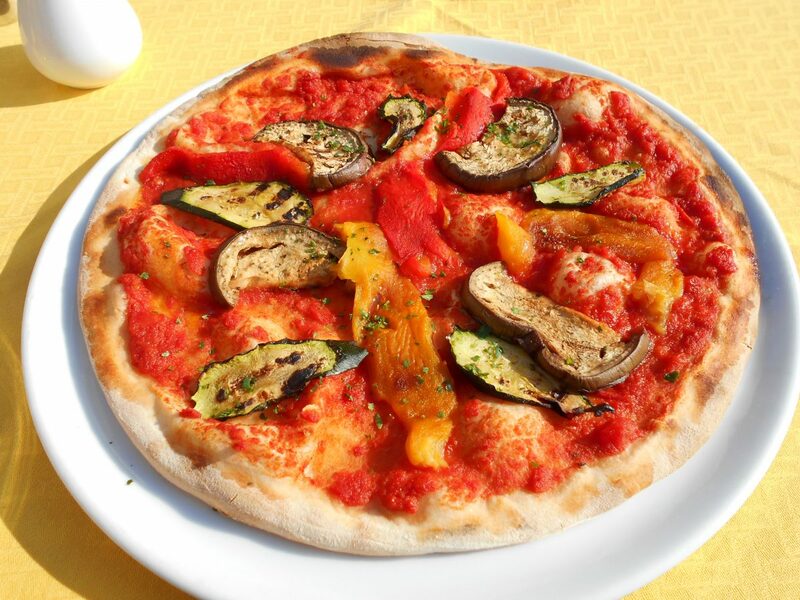 I chose the pizza verdure (without cheese, of course), which came topped with zucchini, eggplant and red and yellow bell peppers. It looked nice enough, but the crust was so hard that it was actually quite difficult to slice (if you’ve never had pizza in Italy before, it never comes pre-sliced). Maybe it was because all they gave me was a butter knife, or maybe it was because, as Nick likes to remind me, I don’t know how to hold cutlery properly (I eat with my fork in my right hand and my knife in my left), but for whatever reason I found this pizza almost impossible to eat. I eventually gave up and just ripped it apart and ate it with my hands. I am well aware that this is NOT socially acceptable in Italy, but whatever. We were mostly surrounded by tourists anyway. Which is why it’s risky to just pick a restaurant at random and take your chances like we did. In a place with so many tourists around, there are bound to be plenty of restaurants that cut corners when it comes to quality. There’s just not that much incentive for them to keep their customers satisfied when they know there will be a fresh boatload arriving the next day. So, before heading out to dinner I did a bit of research on some of the restaurants that had caught my eye while walking around town that afternoon. I settled on La Feluca, which was just up the road from Hostaria Galileo but had gotten mostly positive reviews. This proved to be a much better choice. The menu item that had initially drawn me in was “pasta e fagioli alla veneta”. I was familiar with the typical “pasta e fagioli” dish, which is a naturally vegan soup made with pasta and beans, but I wanted to see what the local Veneto version was like. Well, it turns out that the local version contains the meat from a pig’s cheek. Umm, no thanks. Our waiter was very accommodating, though, and when I explained that I was vegan (and what that meant) he offered to make me a pasta dish with tomato sauce, mushrooms, vegetables or anything else I wanted. By that time, however, I had noticed another menu item called “gran buffet di verdure”, which just sounded too good to pass up. 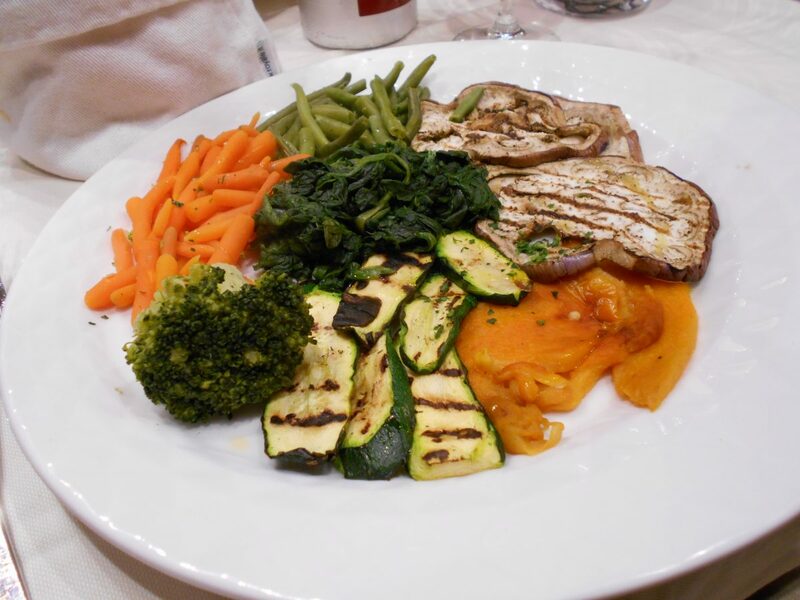 And indeed, what I got was a huge plate with a mixture of grilled and steamed vegetables, including spinach, carrots, green beans, peppers, broccoli, zucchini and eggplant. I realize that a plate of plain vegetables would not be to everyone’s liking, but I was quite pleased to have such a healthy option available. One word of warning is in order, however. 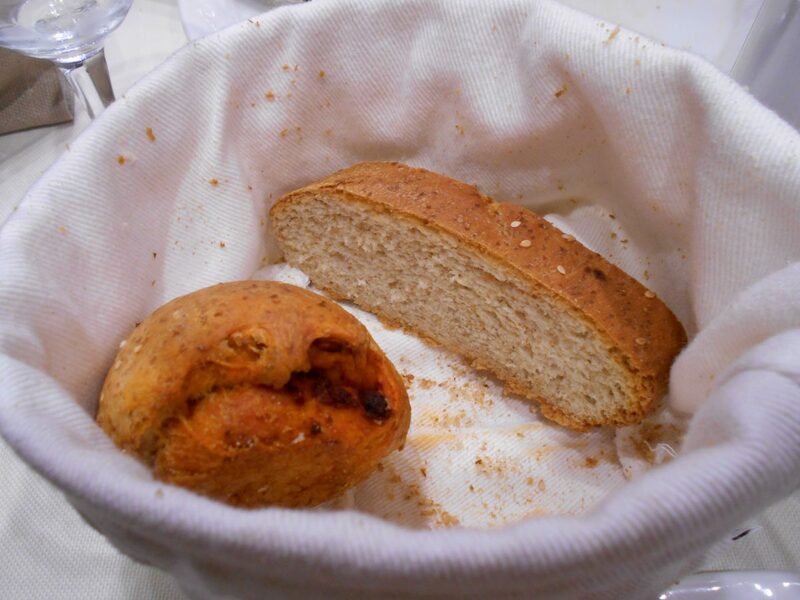 I had been happily chowing down on the slices of whole-wheat bread served with our meal, when I got to the bottom of the bread basket and saw two little bread rolls. It was not until I had already torn one apart that I realized they were not just plain bread rolls but were in fact stuffed with something, and that something turned out to be a kind of spicy sausage. Say WHAT?! I was pretty shocked, as I’ve never encountered anything like that before in Italy. It seems to me that this would upset a lot of people – not just vegans and vegetarians, but also anyone who doesn’t like or can’t tolerate spicy food. Not to mention Muslims, assuming the sausage was made from pork. The bread roll on the left is NOT vegan. So I guess that kind of ended the meal on a bad note, but apart from the bread rolls I do recommend La Feluca as a high-quality and vegan-friendly restaurant in a town where both those qualities seem to be lacking in comparison with other parts of Italy. 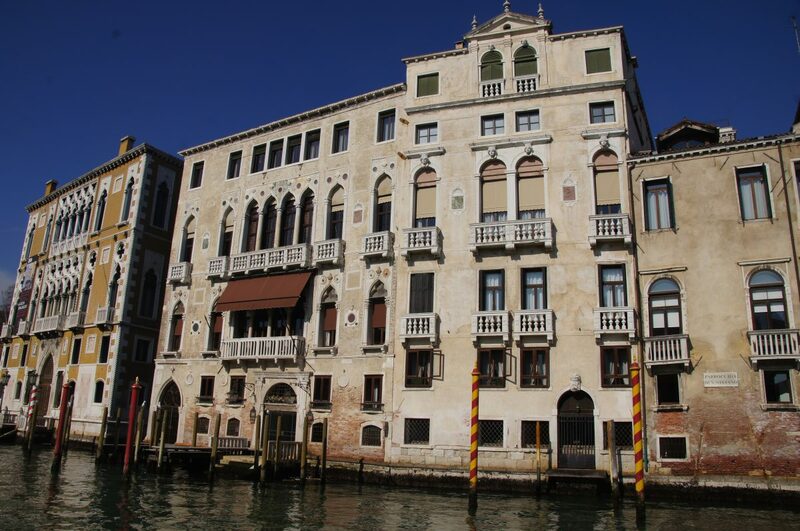 We were staying in a little studio apartment in San Marco district, which meant that we had a stove at our disposal. So, any guesses as to what I had for breakfast on both mornings in Venice? 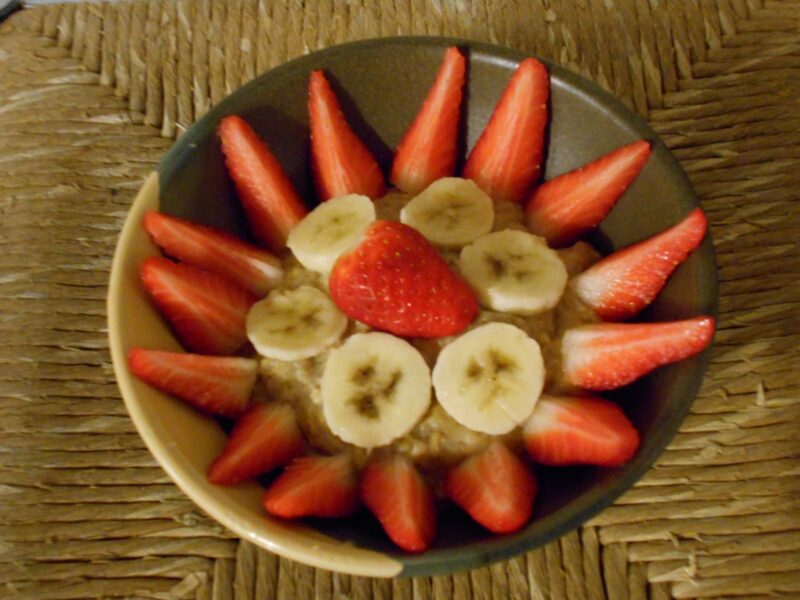 If you guessed oatmeal, you’d be right! Add oats, flaxseed, cinnamon and salt, and reduce heat to low. 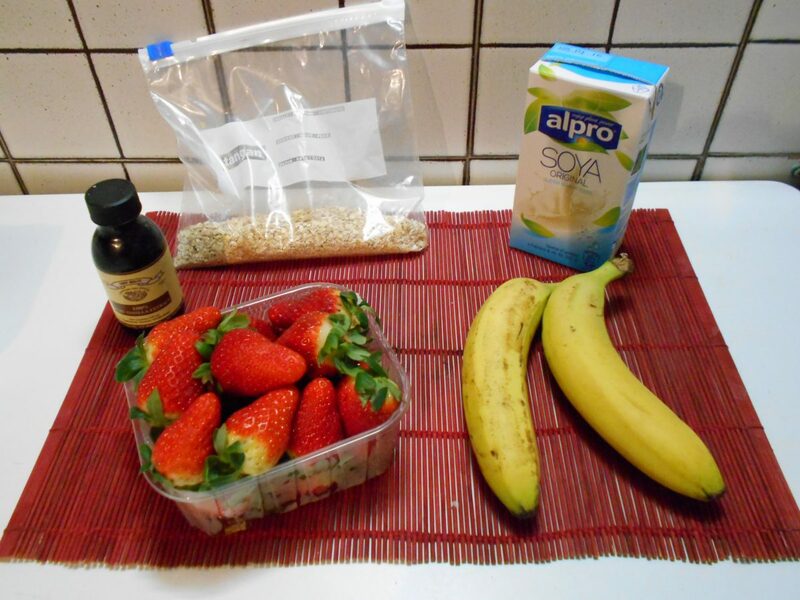 Once the oats have absorbed some of the milk, add vanilla extract and 1 tbsp of the strawberry compote. 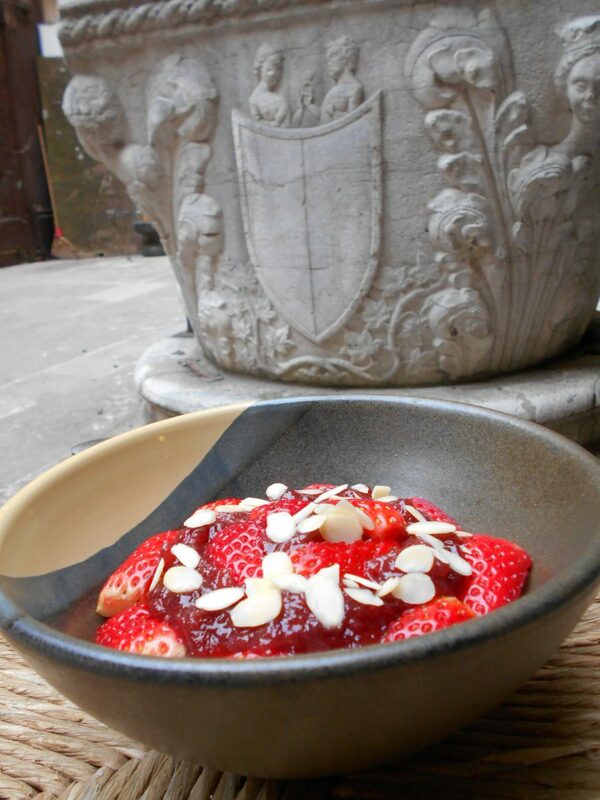 When the oats have plumped up to your liking, pour into a bowl and top with strawberries, almonds and the rest of the strawberry compote. If you’re actually traveling to Venice (or anywhere else) to make this, here’s how I recommend going about it. Prior to departure, place the oats, flaxseed, cinnamon and salt together in a Ziploc baggy. Throw a small bottle of vanilla extract (100ml or less) in with the rest of your creams and liquids, and buy the other ingredients on the spot at a local supermarket. 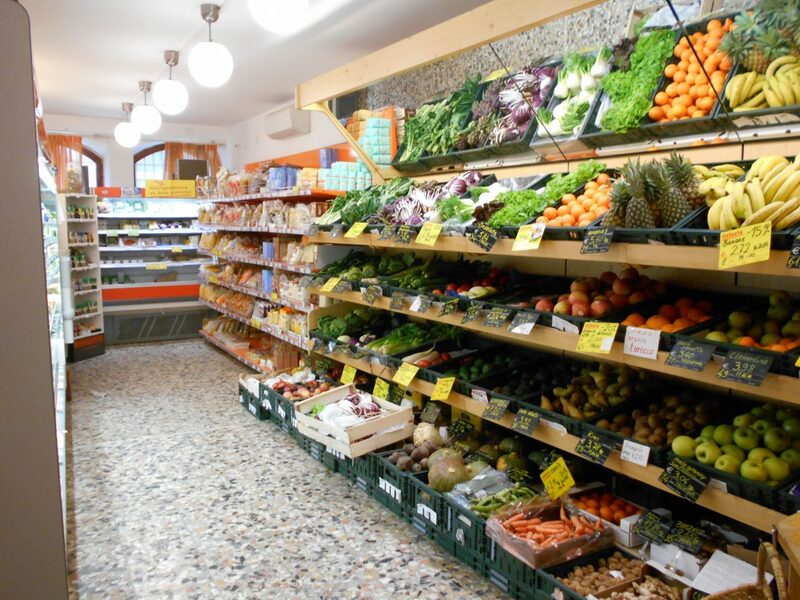 Actually, let’s go ahead and take a quick tour of an Italian supermarket; I think you’ll be surprised at all the vegan foods that are available. Of course you don’t need me to tell you about the pasta, bread, rice, beans, chickpeas, lentils, fresh fruit and vegetables, etc. But did you know you can also buy vegan chocolate chip cookies?? Yep, you can. 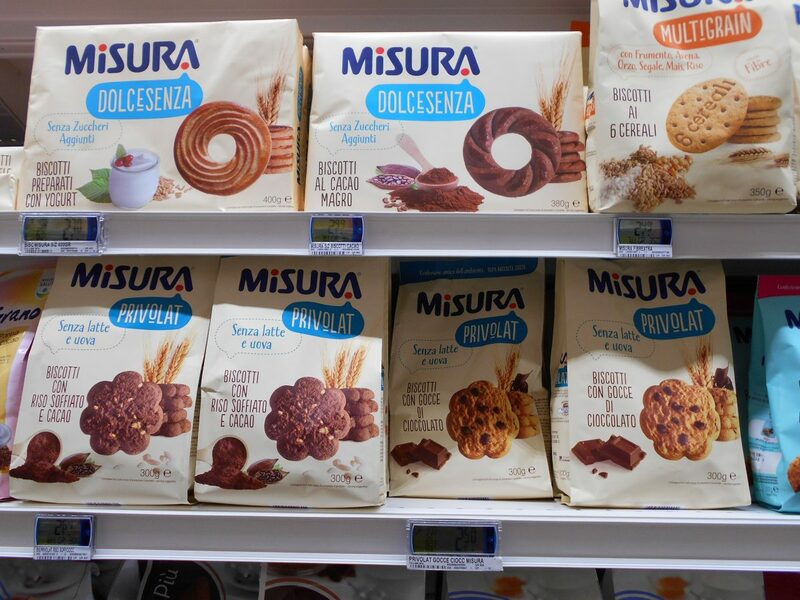 Keep an eye out for the Misura brand, which makes a variety of sweets without various undesirable ingredients, e.g. cookies without gluten, cookies without added sugar, or – and here’s the kicker – cookies without eggs or milk (senza latte e uova). 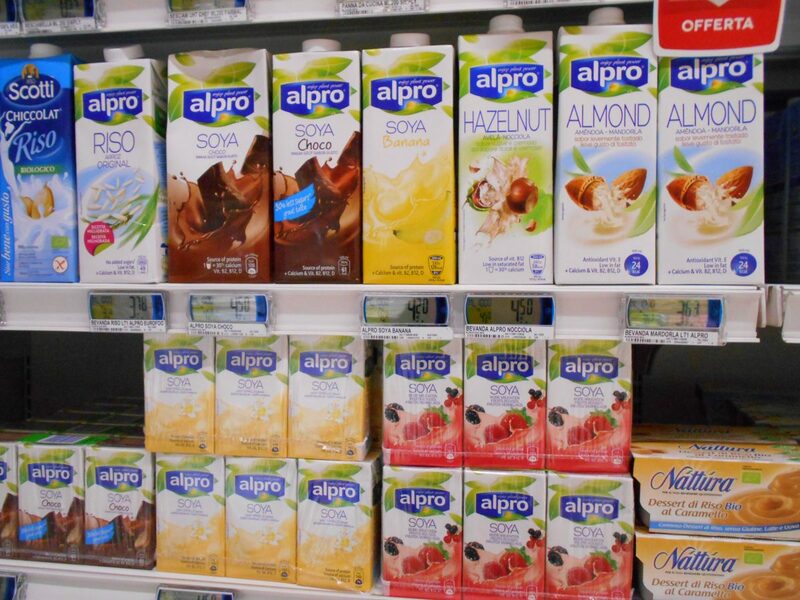 And then there’s the plant-based milks, yogurts, custards, etc. The supermarket near our apartment had a huge selection of milks, including soy, rice and almond, and they even carried different flavors, like vanilla, chocolate and banana! These were all in aseptic packaging and so were on the long-life shelf rather than in the refrigerated section. And don’t ignore the deli section either; it’s not all meats and cheeses! If you’re looking for some picnic food or just an easy takeaway meal, there are plenty of vegan options (polenta, farro salad, grilled peppers, eggplants, etc.). This is also where I picked up the composta fragola (strawberry compote or preserves) that I used in my oatmeal. It’s similar to strawberry jam, but without the added sugar. So, as you can see, you can find just about anything you want; the trickiest part will probably be finding the supermarket itself! They tend to be hidden down small side streets, but once you find the tiny entrance way it leads into an Aladdin’s den of endless food options. 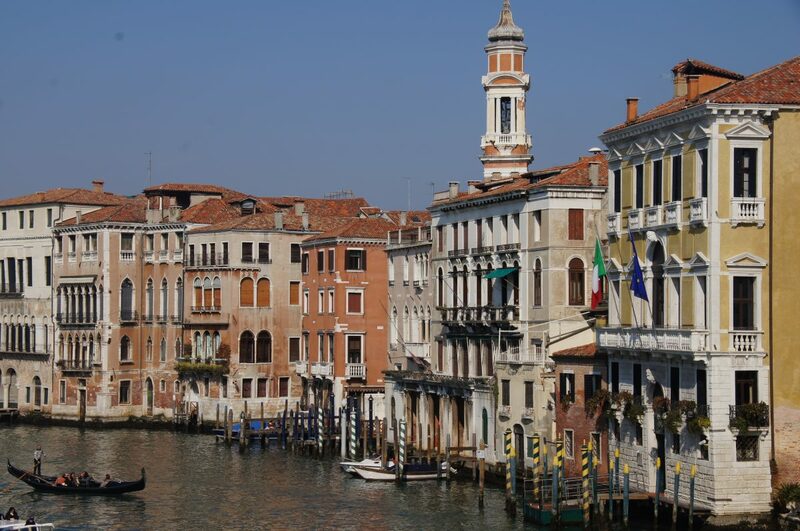 On our first morning in Venice we took a quick boat ride out to the nearby islands of Torcello and Burano. Torcello’s main drawcard is its fascinating 7thcentury Byzantine cathedral, while Burano is more of a wander-and-soak-up-the-atmosphere kind of destination. 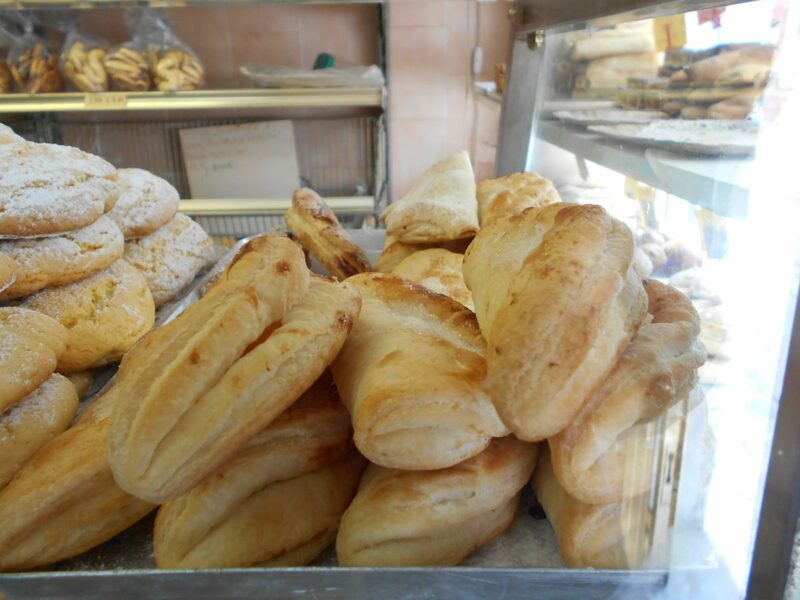 It was on just such a wander through its streets of brightly-colored houses that I stumbled on this little no-name bakery. 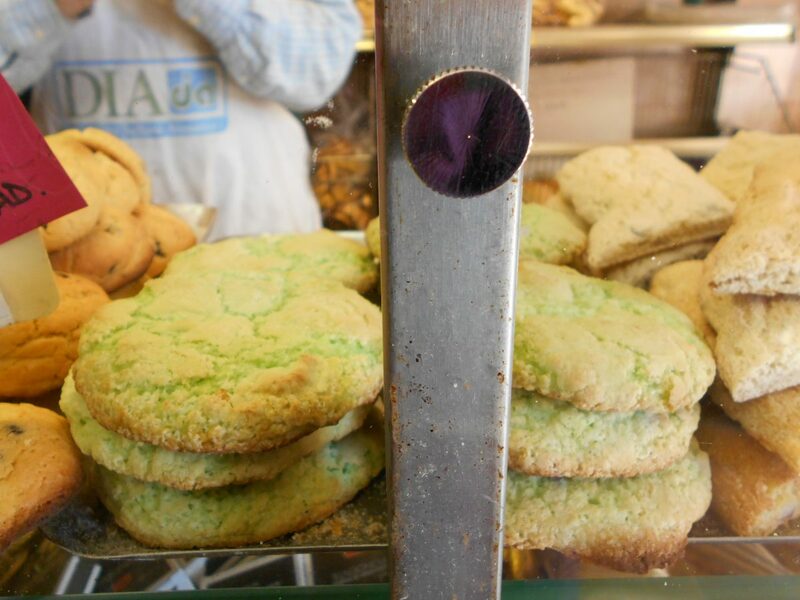 OK, so according to the kind, elderly gentleman behind the counter, the name is Panificio Garbo Giorgio. You won’t know that unless you ask, though, because there is no sign anywhere in sight. This guy obviously doesn’t feel any need to hawk his wares to the tourists passing through. 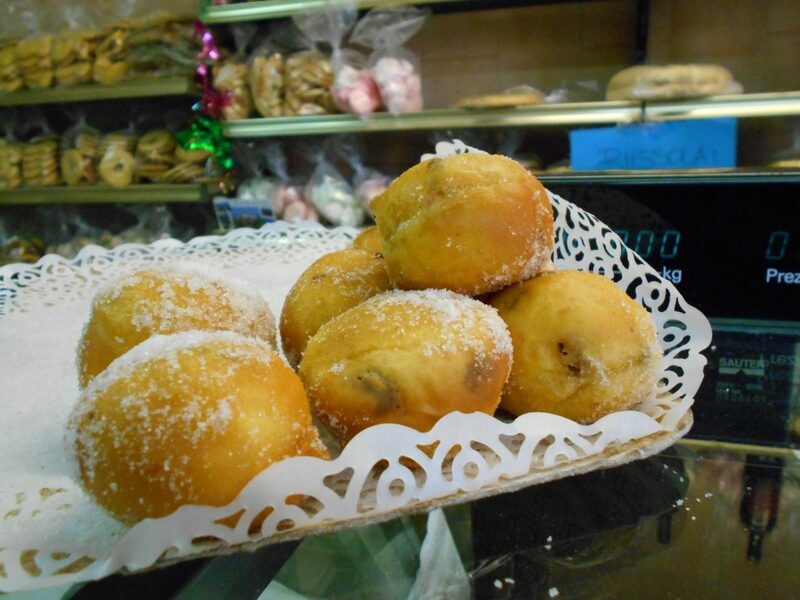 And, the one I chose, these doughnut holes speckled with raisins. This great bounty of vegan sweets in a no-name bakery made me wonder if such treats were actually a common find in Italy that I had somehow overlooked, but alas, I tried asking in a couple other bakeries around Venice and didn’t have much luck. 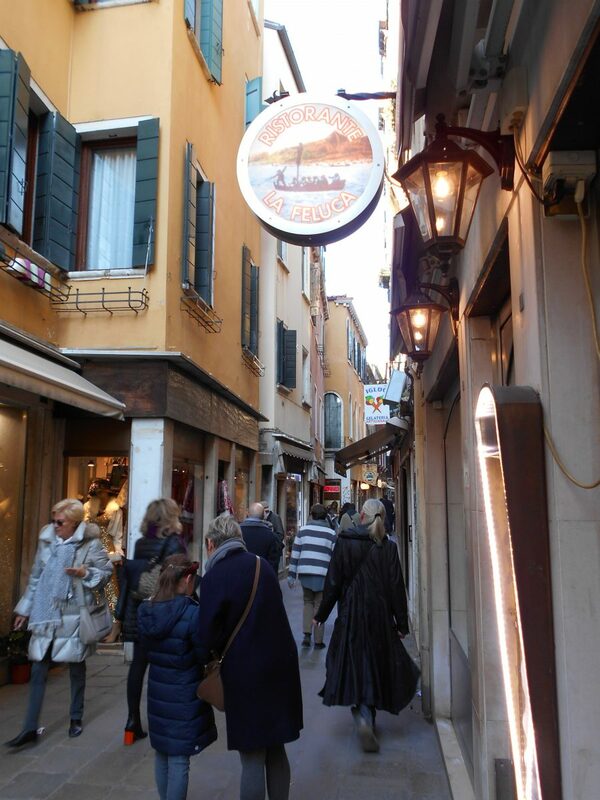 Indeed, even some of the gelaterie didn’t carry any flavors without milk, which is highly unusual in Italy. 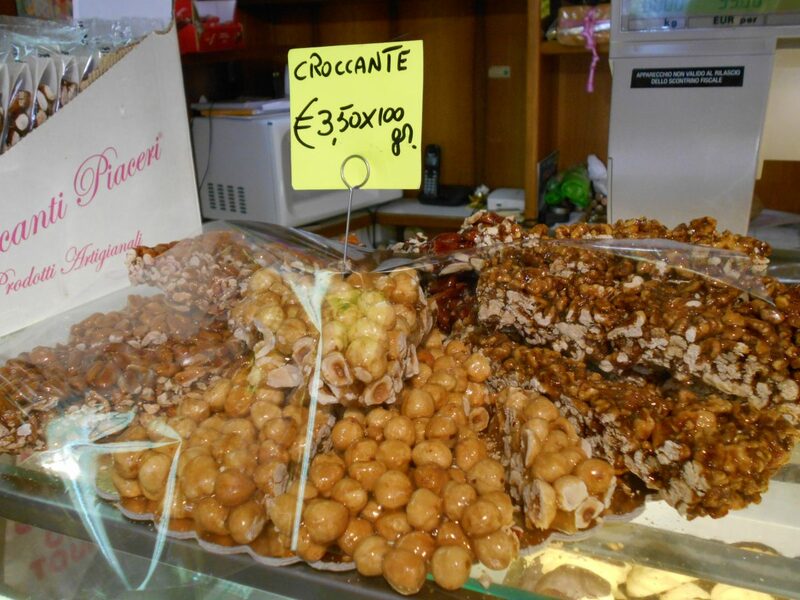 The one thing I did turn up was croccante, which is basically nut brittle made from various kinds of nuts and can be found in most pasticcerie (sweets shops) around town. These may or may not contain honey, however, and the man behind the counter at Pasticceria Bar Targa, where the photo below was taken, was unable to tell me one way or another about his own croccante. Marzipan is another vegan option, and panforte (a kind of fruitcake) is generally made without eggs or milk but does often contain honey. By lunchtime we were back in Venice proper and were hoping to eat at La Zucca, a restaurant that gets great online reviews and is known for its vegetarian options and its creative use of pumpkin. Unfortunately, it was fully booked for both lunch and dinner, so I can’t give you a personal report. If you’d like to check it out yourself, be sure to book in advance, and leave a comment below to let me know how it was! All was not lost, though, because we retraced our steps to a place nearby that had caught my eye on the walk to La Zucca, and here we ate what turned out to be the best meal of the trip. 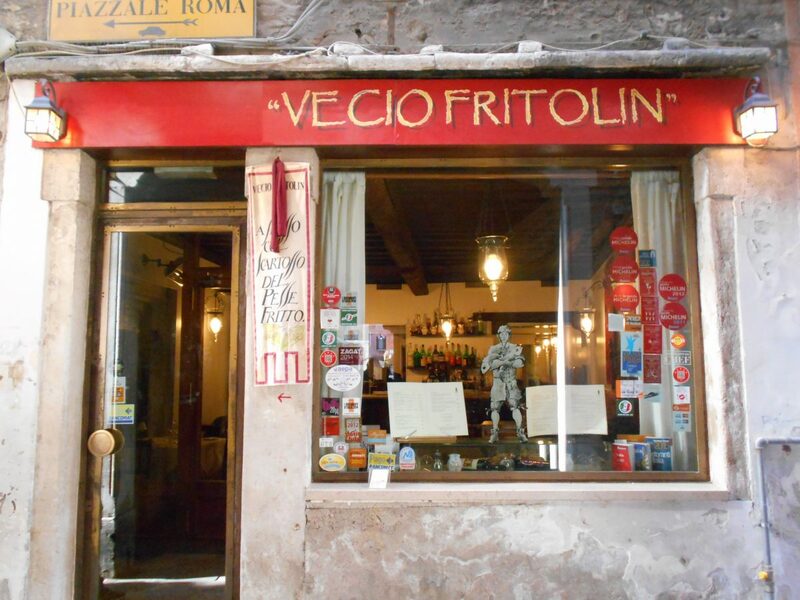 Vecio Fritolin is a small but classy restaurant in the backstreets of the Santa Croce district. While it’s not a vegetarian restaurant, they seem to have a penchant for reworking old favoriteswith atypical ingredients, which has led to the most unusual offering of…wait for it…vegan linguine carbonara! While the original carbonara recipe is made with eggs and pancetta (a bacon-like pork product), the Vecio Fritolin version uses a creamy sauce made from puréed yellow bell peppers and pancetta-sized bits of sautéed potato. So it’s completely vegan! Oh, and the linguine is made from kamut instead of the usual refined white flour. This dish was absolutely delicious, and I still can’t believe that it was served by a mainstream restaurant, i.e. one that did not otherwise seem to be catering to a vegetarian or health-conscious crowd. I take this as a positive sign that Italians are becoming more willing to adapt their traditional recipes to modern tastes and needs. And in fairness, I should say that ALL the restaurants we ate at in Venice showed a great willingness to accommodate me and adapt their dishes as much as possible. I’ve said it before and I’ll say it again: You are not limited to what’s on the menu! Far from being a limitation, becoming vegan has given me the courage to ask for what I really want, and nine times out of ten I get it. In the case of Vecio Fritolin, the server offered to make me a plate of fried vegetables or a serving of their homemade potato gnocchi with tomato sauce. I decided to stick with the veggie carbonara that had drawn me in to the place to begin with, and I was glad I did, but I must say that Nick got the gnocchi and they also looked a-MAZ-ing! Oh, and while we were waiting for our meals the server brought out the most wonderful snack – hazelnuts seasoned with turmeric! I had never seen or heard of such a thing before, but they were delicious. 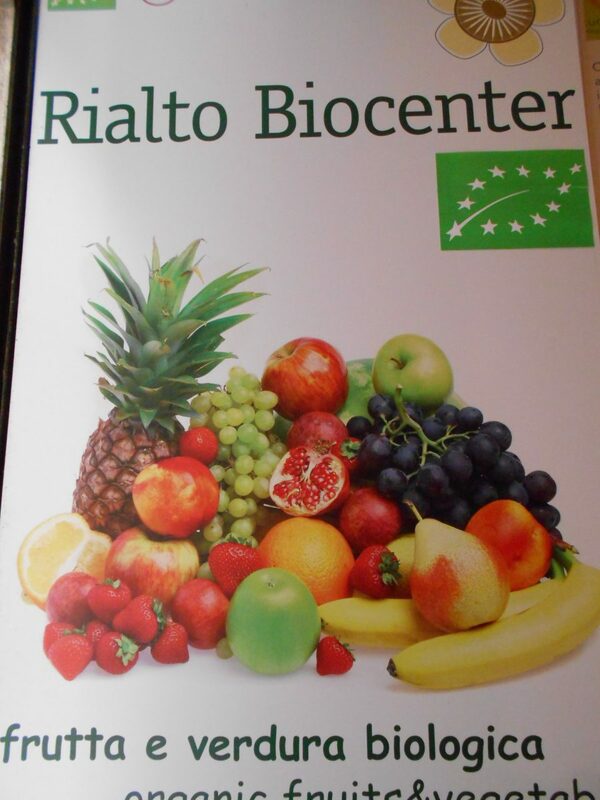 And if you don’t manage to find everything you need at the regular supermarket, there is an organic health food store called Rialto Biocenter just a couple doors down from Vecio Fritolin. 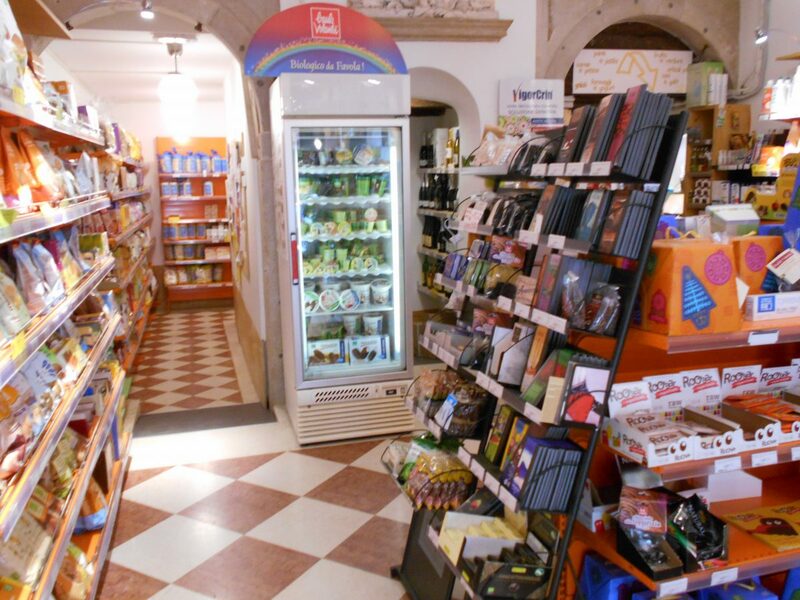 They have a good selection of organic fruits and vegetables as well as some vegan chocolate bars, energy bars and other goodies. The Vivaldi hazelnut dark chocolate (nocciola fondente) is to die for! It tastes just like Nutella as I remember it, but without all the oil. 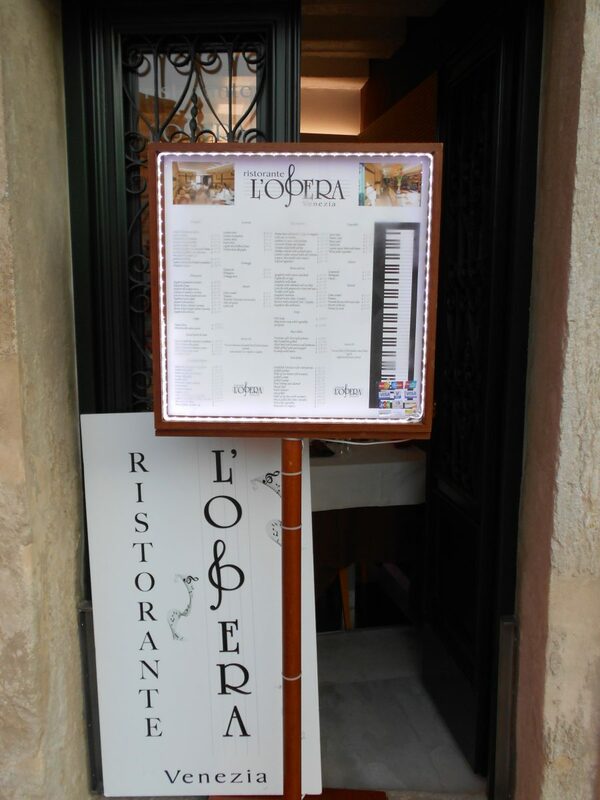 For dinner, once again we stuck to the Campo Sant’Angelo area near, this time settling on the Ristorante L’Opera. I had seen on the menu out front that they offered minestrone with vegetables and pasta as well as a spaghetti dish with tomato and basil, so I planned to order one of those. 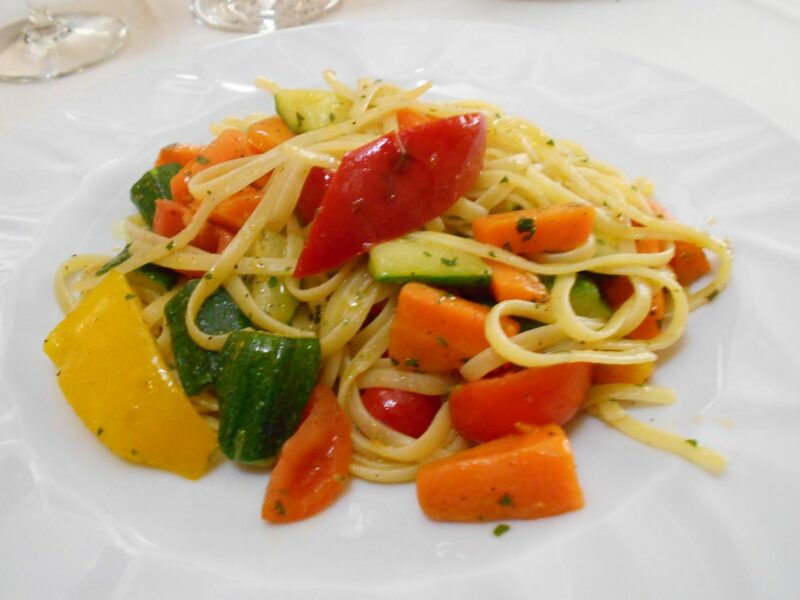 Linguine with hearty chunks of zucchini, carrots, bell peppers and cherry tomatoes tossed in olive oil and fresh herbs. Yet another yummy vegan meal in Venice! 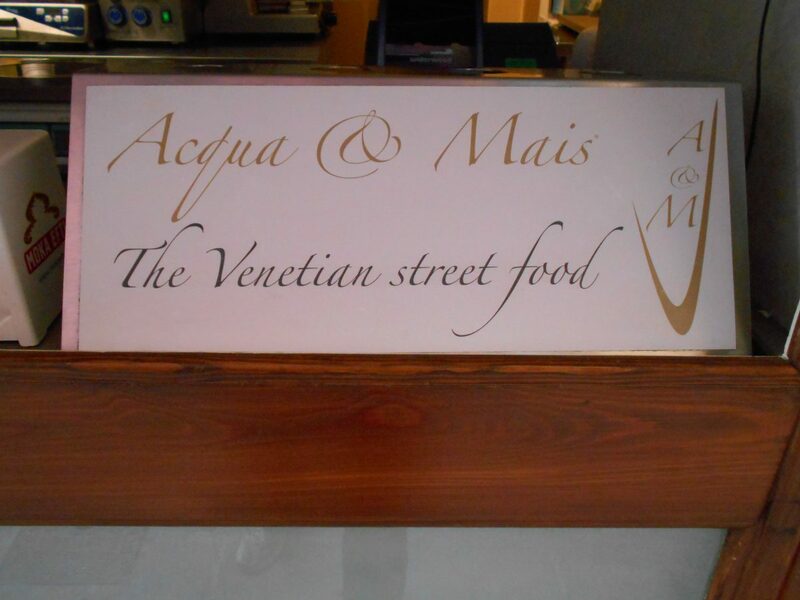 I didn’t really plan to have two breakfasts that day, but I had read about this place called Acqua & Mais that does traditional Venetian street food, so when we stumbled upon it on our morning walk I decided it was fate. 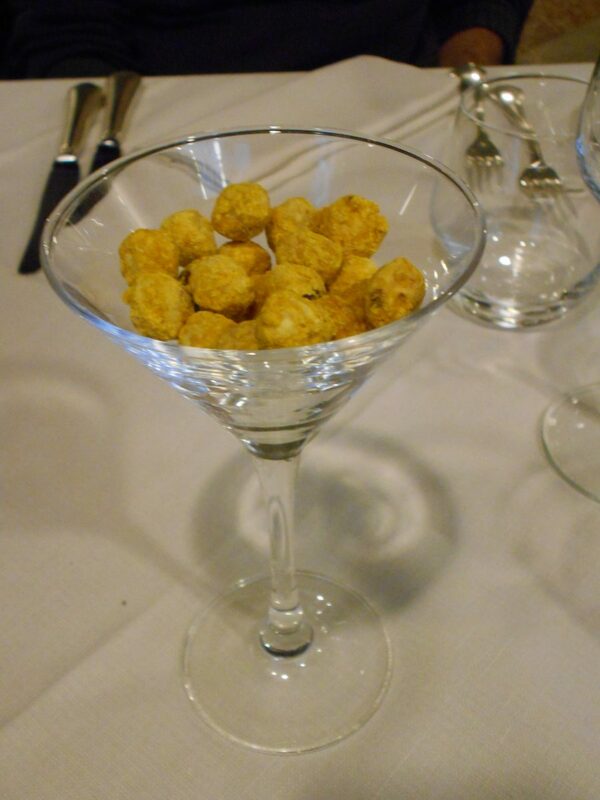 The name “Acqua & Mais” means “water and corn”, which is exactly what the polenta here is made of. Some places add butter, but you won’t find that here. 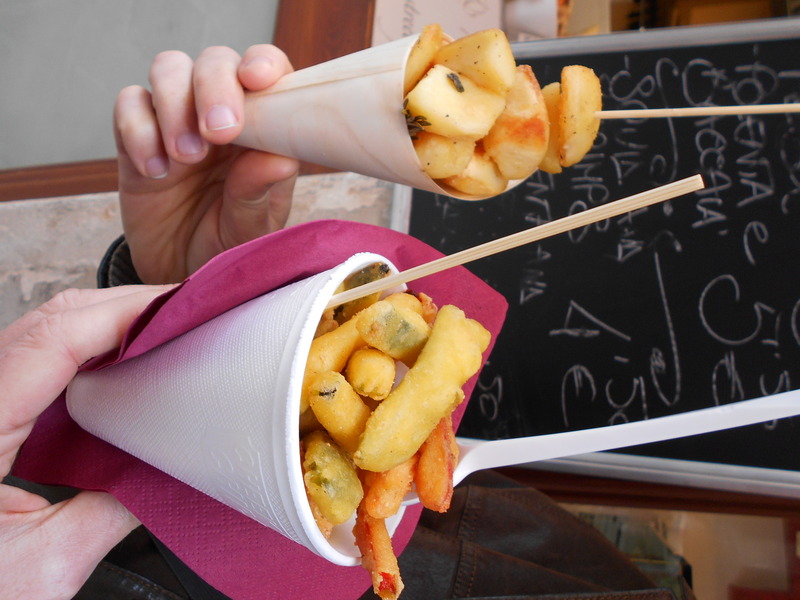 Which means that a cone of steaming hot “polenta e verdure” (polenta topped with fried vegetables) makes for a delicious vegan snack. You could also grab some white beans in tomato sauce or some roasted potatoes with rosemary. We had time for just one more meal before we hopped on a boat back to the airport, and, after a couple of failed attempts to eat at places that were either shut or fully booked, we ended up at a restaurant called Antico Pizzo Risorto. It wasn’t until we’d already been seated and had perused the menu that we discovered their pizza oven wasn’t working. This meant that both the bruschetta and the veggie pizza I’d had my eye on were now off the cards, and I ended up with a plate of vegetable side dishes. I was annoyed at first, as this was not what I had pictured eating for my last meal in Italy, but as soon as the food was served I stopped complaining. It was scrumptious. 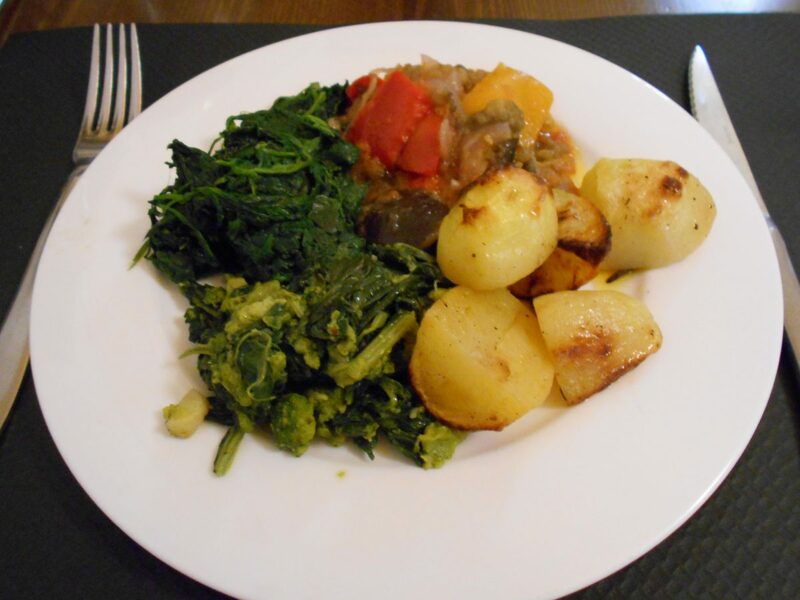 There were four different dishes: roasted potatoes, some type of boiled greens (chicory? ), broccoli mixed with another, slightly more bitter green, and a kind of baba-ghanoush-style eggplant dish with chunks of bell pepper. So our foodie tour of Venice ended on a positive note after all and, apart from the brick of a pizza on the first day, was a rounding success. I will admit that Venetian cuisine does not seem to include that many naturally vegan dishes compared with other local cuisines in Italy, but, thanks to the friendly and accommodating attitude of the locals, this is no problem at all. Whether it’s pizza, pasta, risotto or simply a mix of side dishes, you’re sure to have a delicious meal put together for you just about anywhere you go, as long as you can avoid the tourist traps. Below is a new, reader-requested feature on the blog – a map of all the places mentioned in this post! Leave a comment and let me know if you find this useful, or if you have other features you’d like to request. 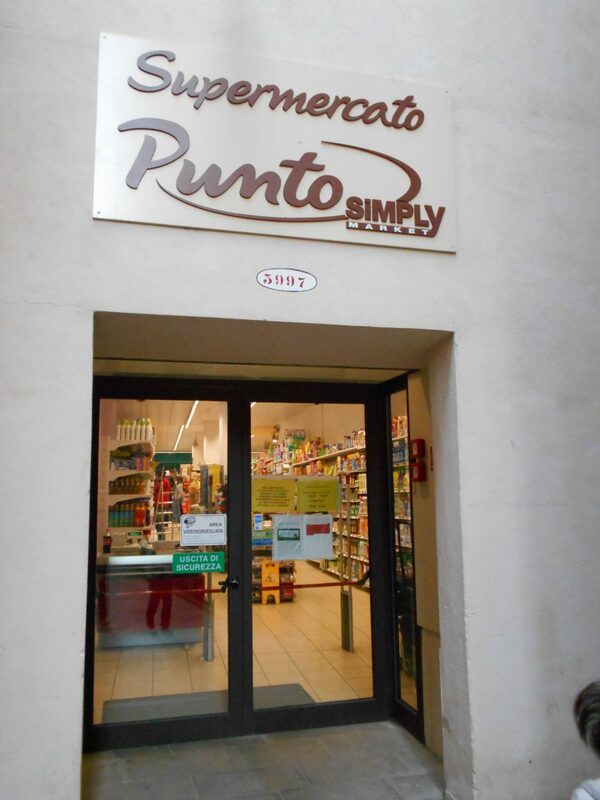 Hi, I found a nice Bio shop in Corte Coppo (Calle Coppo, Ramo Coppo), off Calle Fuseri, near Ponte dei Fuseri (San Marco). 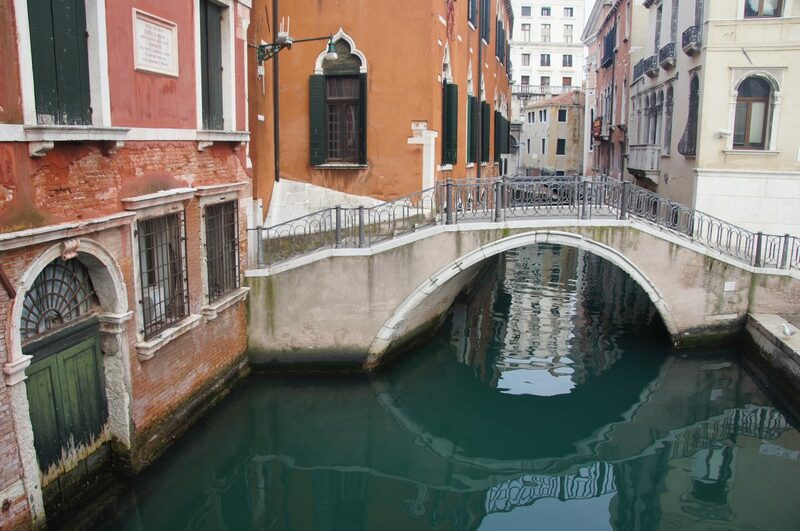 (In Google maps, best put in Ponte dei Fuseri, or Ramo Coppo, with Corte Coppo one lands in Arsenale, instead of San Marco). That’s great Sybil, thanks so much for sharing! Thanks for the great suggestion! I’ve just checked out their menu, and it sounds delicious. There are no prices listed, so I imagine it’s a rather upmarket restaurant, but would be great for a special occasion (and just being on holiday in Venice is a pretty special occasion already). Cheers! Hi there! Wow, this blog is so cool!! I just found it while looking for vegan traditional Spanish foods and then I stumbled upon this article of the vegan food you ate in Venice and wanted to give you a couple of tips. Never ever ever get pizza or bruschetta in Venice if you want to taste the real, traditional italian thing! 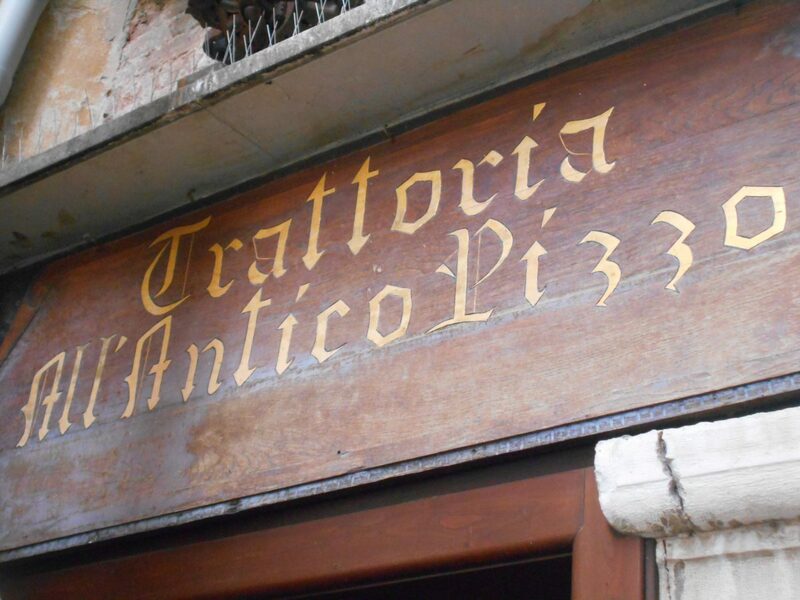 Due to architecture issues, people in Venice are not allowed to have the traditional wooden oven that’s used anywhere else in Italy to make pizzas and bruschettas. They will just use an electric oven and pizza won’t have that unique texture that you find in other italian restaurants. 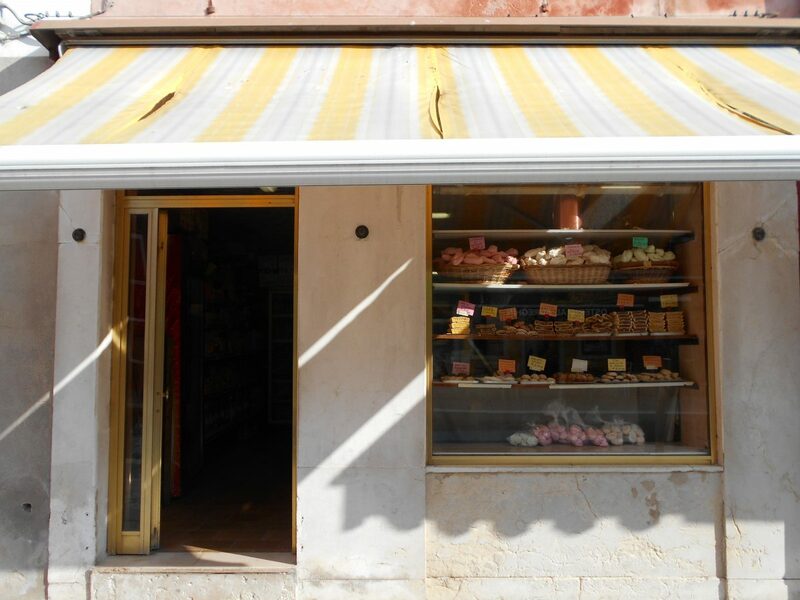 Venice is usually well known for seafood and fish, so it’s not the best place for a vegan or a vegetarian (but that doesn’t mean we can’t have other amazing foods while there). That’s weird. I’m from Veneto and I’ve always had it without any pig in it. So maybe the pig is a Venice thing? I don’t know. I hope you had a good time in Venice! Thanks for your comment! 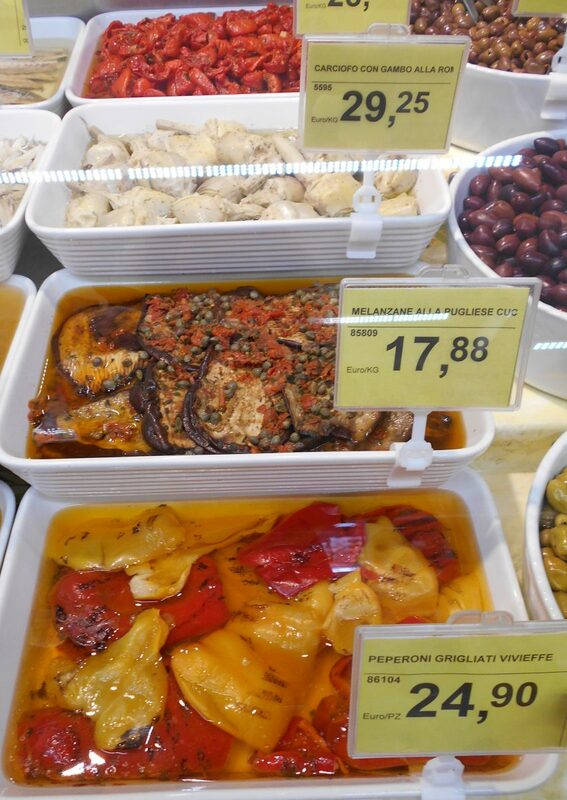 Since you were looking for vegan traditional Spanish foods, I hope you also found my Ultimate Vegan Guide to Spain post. I’m actually in Spain right now; just yesterday I arrived in Santiago de Compostela after spending the last 39 days walking across the country on the Camino de Santiago. Even though traditional Spanish food is pretty meat-heavy, I managed to find plenty of vegan options along the Camino. Overall, I find Italy to be much more vegan-friendly than Spain, though you’re right that in Venice most of the restaurant menus feature fish and other aquatic animals. 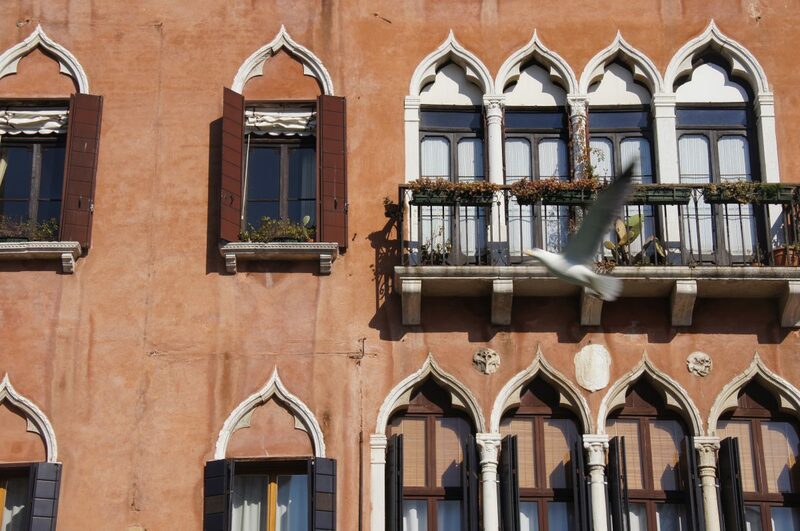 That’s very interesting about the wood-fired ovens not being allowed in Venice. I guess that explains why my pizza there wasn’t very good! And you also make a good point about the vegan croissants being widely available for breakfast. I don’t usually eat breakfast myself, but on my recent trips to Italy I have noticed that more and more bars are offering plant-based milks and vegan croissants. I wouldn’t have gone so far as to say that you can find these in ANY bar or café, but things are changing so quickly that maybe by now that’s true!